“My wife and I were thinking of selling our house. As an inactive realtor I thought about listing it myself. Mary and Kaitlan Klein sold two houses on our street for record pricing. I asked them to meet with us and give us their opinion of value and how they would market our property. They suggested a price that was much higher than what I thought we could get and had a great marketing plan. We went ahead and listed our home with them. I actually suggested that they lower our price as I thought it was priced too high. They said – No, let’s be patient. We agreed. Two weeks later they sold it for the highest price in our neighborhood! “Over the past 18 months, we have had the privilege of working with Mary and Kaitlan Klein on two separate occasions. The first time was when we were selling our family home of 20 years. We selected Mary Klein initially because of her amazing track record of success and also because of our first meeting with Mary and Kaitlan. We interviewed a number of leading agents in the area, but it was Mary and Kaitlan who demonstrated a level of sensitivity, commitment, and trust, that was head and shoulders above the others. They energized the sales engine in record time, with marketing materials and advertising. Our home was sold almost overnight. Fifteen months later, we began searching for our new home. Naturally we reached out to Mary and Kaitlan again. They took the time to understand what we were looking for and matched us up with a home and property that is perfectly suited to us. As we were working the purchase remotely, they went out of their way to help us navigate the process and ensure a smooth purchase. “The choice was obvious, after selling and buying with Mary and Kaitlan Klein, that she would be our Realtor once again. Mary and Kaitlan have the knowledge and experience you can trust. We have complete confidence in them and would highly recommend choosing Mary and Kaitlan as your Realtors. “In today’s marketplace especially, it can be a daunting task to select the right real estate agent for your needs. We chose Mary Klein of Sutton’s because she came recommended as an expert in her field, someone with decades of experience in the business, a proven sales record in our general area and, above all, someone we could trust. We were not disappointed. Mary, and her daughter Kait, worked tirelessly in the promotion of our listing. Their personal investment of time with us (which included being present at every showing), their strong media presence combined with exceptional photographic and video presentation as well as their support, advice and amenability – all served to reinforce that we had indeed made the right decision. “We very much appreciated how Mary took the time to understand our needs and priorities in selling our home. She was recommended for her knowledge of the current housing market which provided us with the comfort we needed in the selling process. Putting our house on the market started off being traumatic in many ways but from the onset Mary was gracious, calm and focused leaving us in a relaxed stress free manner. The excellent pictorial presentation of our home along with multi-media and MLS marketing resulted in the sale our home within a week from time of listing. “We are glad to have worked with Mary Klein for our home purchases and for the sale of our house recently. She and her team provided us with expert advice. Her extensive and insightful knowledge of the market, specifically in the area where we are interested in buying a property, is priceless! She has a keen eye for detail, making sure that paperwork is done properly and she sure can deliver, she was able to sell our house within 4 days upon listing. “We have enjoyed working with Mary Klein and her team. She is very articulate, patient and professional. Her level of service exceeded my expectations. Her website is; fantastic, professional, user friendly and the photography is spot on. I recently have had the pleasure to work with Mary Klein. Not only did she prove to be professional, efficient and delightful, but also went far and beyond her duties and responsibilities. She always put the best interests of her clients before her own. In the past I have worked with many agents, some good, some not so good. Fortunately, the selling of our home was a wonderful experience thanks to her great work ethics and professionalism. Having Mary Klein as our real estate agent, in several transactions has been a very positive, professional, friendly experience. The trust and respect we feel for her has allowed us to refer her to our friends with confidence. The feedback from our referrals has been nothing short of pure satisfaction with the same feelings that Mary is a very trustworthy person with integrity, which all agents do not possess. Stepping into the Sutton Group office and finding Mary Klein was like winning a Lotto 6/49! She knows that we all are people of equal qualities, and went to the extreme to find us real value for our money. Buying a house with Mary was a positive experience. I was a nervous first-time buyer with no idea where to start. Mary explained everything fully and was supportive from start to finish. We have to say, Mary Klein, that you are the ‘best’. You devoted yourself to selling our home with a 10 plus effort. You showed and sold our home with the same 10 plus enthusiasm. You said you could get more for our house than the competitors, and that’s just what you did by several thousands. We are very grateful for your support and help during this emotional period in our lives. I would like to thank you for everything, from responding to my first email to the continuing effort you brought forward in selling our home. You never gave up the search to find the right buyer for our home even after numerous showings and offers that fell short. Your professionalism and wonderful demeanor got us through this experience. It was a comfort to know we had such a caring and conscientious person working for us. Mary has sold houses for our son and daughter in Orangeville, and more recently, she listed and personally sold our Caledon home in 7 days, and assisted us in the purchase of another home. All of us found Mary to be efficient and hard working on our behalf. She is most definitely a credit to her profession. We are now retired and we needed to sell our home at the best price and in the shortest possible time and Mary achieved this for us in less than 2 weeks. Smooth move, Mary thanks so much! I found Mary to be very genuine and caring while handling the selling of my home under difficult personal circumstances. She was not pushy and has an easy manner which made the negotiation simpler. Mary was great to deal with. Mary listed out home and sold it herself after just 6 weeks on the market. She is hardworking and a true professional and a pleasure to work with. 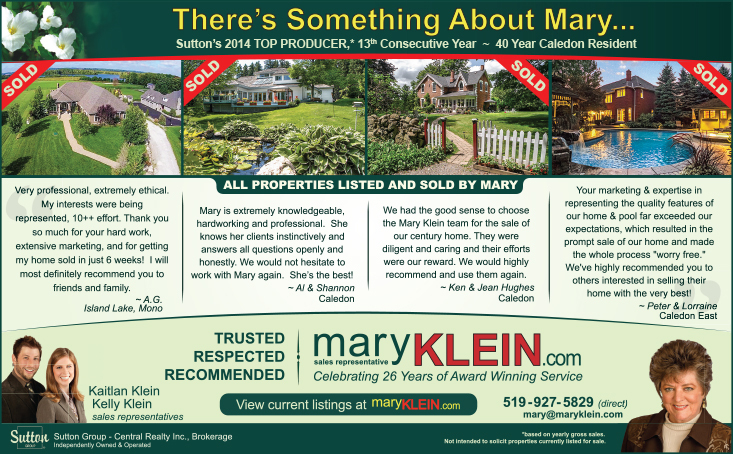 If we were asked today whom to select as a real estate agent, the name without hesitation would be Mary Klein. Sold – I’m sold and so is my home! In a difficult market Mary Klein has displayed the dogged determination and perseverance which make her a leader in her profession. To accomplish all this with a bright and happy attitude makes Mary a pleasure to work with, and I would not hesitate to recommend her services to anyone who is considering buying or selling in the future. Mary Klein has been an ideal agent in a difficult market.  She has shown a concentrated effort in selling my property and has shown a vast knowledge of the Caledon area. T. D.	We knew we were in for a difficult time selling our home in today’s tough market. We came to understand what it takes for an agent to find a willing purchaser, let alone get them committed. You must be able to forge a relationship with all parties based on trust, friendship and faith. Mary has that ability. She has what it takes and does what it takes to get a home sold. We have no hesitation recommending Mary to our friends. I must commend you on the professional integrity and conduct you demonstrated during my purchase of a property. Even though you represented the interests of both the vendor and myself, you clearly never crossed the line of honour and proper discretion. I feel that both the vendor and myself received the best of your professional representation and integrity and are both the better for it. Thank you for making a difficult process clear, easy and fun. Thanks very much, Mary, for your professionalism and personal touch in the sale of our home. We have greatly appreciated working with you and getting to know you. She’s good! Mary was supportive and caring during what was for us a stressful situation. She was very honest and explained her role clearly when she acted for both ourselves and the purchasers in an offer in which she was representing both parties. 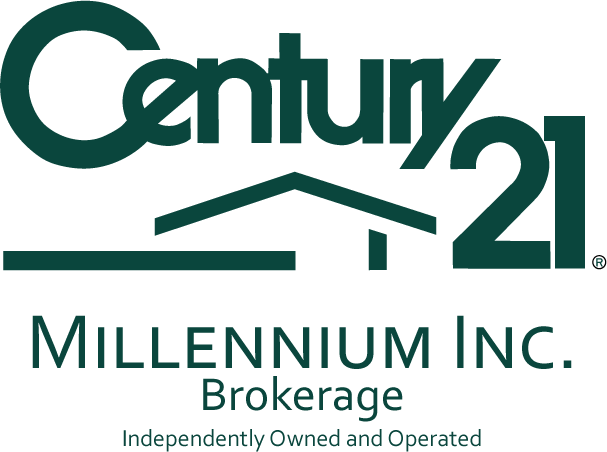 For truly caring representation, extreme honesty and a willingness to get the very best price for your property, there is no other…call Mary Klein…the best in the area, without question! When my wife got fed up to travel the distance to her new place of employment and we decided to sell the house, other agents, underpriced the house to get it sold. Finally Mary came into the picture, she hold out to get the best price and sold our place at the highest price on the street. Mary is professional in all aspects of real estate sales bringing a wealth of experience, market knowledge, and most of all the capability to stay on course, seek out the right purchaser, and close the deal. 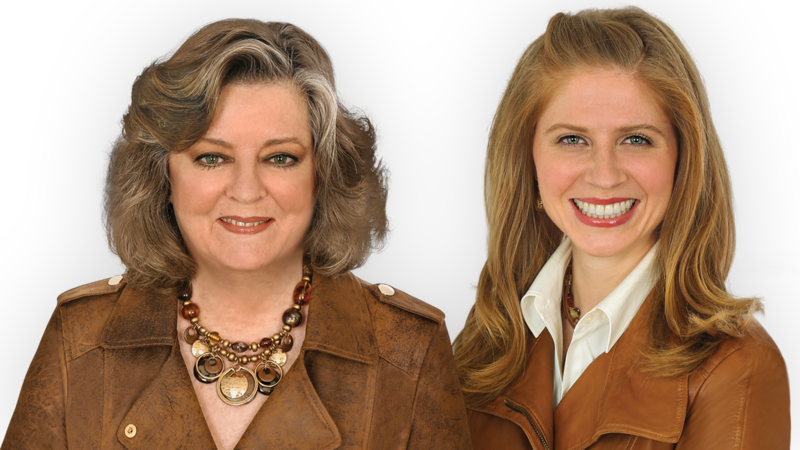 When dealing with Mary you get the total package, especially when you realize the support network that Mary deploys in having her entire family involved in all aspects of the real estate business. This alone is a great benefit to the seller, especially factoring the extensive use of professional photography & video production used in the marketing and advertisement of our realty. Our recent transaction was one of two over the past 3 years. Obviously we came back again. We want to compliment her on the professional manner business was conducted. We had Mary handle our most recent transaction not only because we trusted her, but also her Marketing Support process lead to results. We believe that both our transactions were a direct result of web based promotion of our property. During the listing process we had the opportunity to observe many other real estate professionals. With a few exceptions, Mary embodies the term 'professional'. Mary really showed her friendly, prompt professionalism as she guided us through a complicated transaction involving two rural lots and severances. Real estate management is far from simple, and Mary has measured up superbly. I chose Mary because of her reputation in the Caledon market and having lived there myself for 13 years. I found her to be honest, straight forward and focused. Bottom line is that she is a seller and sold my Caledon country home in 60 days at close to asking price, which many couldn’t do!